A Martian year, one rotation of the sun, takes 687 Martian days, each of 24 hours and 37 minutes in Earth time. Humans on Mars mostly divide Martian days into twenty-four slightly longer hours. They generally use the term ‘year’ to refer to old Earth-length periods of 365 days and ‘cycle’ to indicate one complete Martian solar rotation with its progression of seasons. Martian calendars consist of twelve 57-day months and a three-day “Fool’s Holiday”. Like Earth, Mars’ orbital inclination causes a progression of seasons. The lengthier year means that each season is longer, allowing for two or more harvests in a long summer but a much worse and more extended winter interval. Between autumn and winter the natural geology of Mars causes a fifth, “windy” season of powerful gales and storms. This additional season of Windtide is counted from 22nd October to 40th December, with Winter officially ending on 57th March before Fool’s Feast. Mars’ two moons are tiny; Phobos at 8.9 miles across and Deimos at 3.9 miles across are dwarfed by Luna’s diameter of 2,160 miles. At full moon in the present skies of Mars they appear no larger than a golf ball and a marble respectively. Phobos whizzes around the planet every 7 hours, 40 minutes. Since it moves faster than Mars turns it rises in the west and sets four and a quarter hours later in the east. Deimos has a synchronous orbit over Mars’ equator, where it appears to take around 2.7 days from rising to setting west to east. For the purposes of these novels it is assumed that the Ancients who engineered changes to Mars’ gravity and atmosphere likewise altered the orbits of its moons, bringing them much closer and holding them in place with the same technologies that maintain the other physical changes. Thus Phobos and Deimos have the same orbital characteristics but appear much larger in the sky. 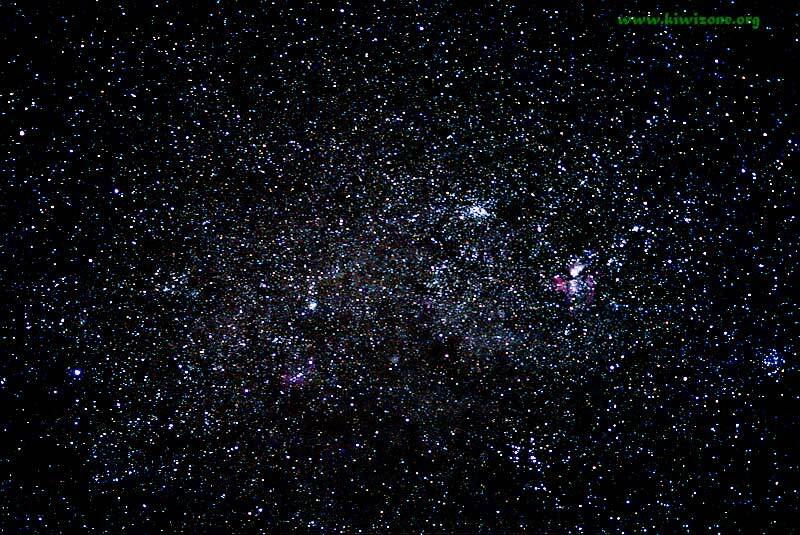 They likewise exert gravitational and tidal forces far beyond their natural mass. Acheron – The dumping ground for the First Men’s failures, Acheron eventually became so inhospitable that no-one who entered ever returned. Acidalia – Large, mountainous marginal domain of the Lord of Fatal Laughter. Albus – A tiny, desolate, eerie island in the Amazon Sea with a significant past; for many years the home of Father De’bias; explored in Dynasty of Mars – Part 3. Amazon Sea – The natural border between the lands of the Black Sorcerer and those of the Sorcerer of Night, the Amazon Sea is home to pirates and several archipelagos such as the Wayward Islands which are unclaimed by the First Men due to their lack of value. Amazonis – The region bordering the Amazon Sea and the sea itself. Arabian Sea – The natural border between the lands of the Sorcerer of Fatal Laughter and those of the Sorcerer of Night, the Arabian Sea is filled with mutated monsters. Bandusae – Regional admin centre of the Pyriphlegethon District, mostly a shipping depot for timber and ores that come from the further settlements. Now blown up. Cerberus Canal – An ancient canal in the shadow of Mount Charon. Daedalia – Also called the City of Joy. The capital of Mars stood on pedestals over a blue lake basin. Home of Princess Aria. It and its famous knights destroyed a eight hundred years ago by the Black Sorcerer. Domrik – A village near Olympus Mons, the birthplace of the rebellion. Its headman is Elder Ardin. Elysium – The central part of the Sorcerer of Nights domain, a pastoral land with a sunset curfew, centred around the Palace of Whispers. Its major seaport is Hyblaos, where the Cathedral of the Silent Sisters dominates a foggy bay. Forests of Utopia – Deep haunted woodlands in the domain of the Sorcerer of Night. Foundries of Cryse – The largest weapon factory on Mars run by slave labour. 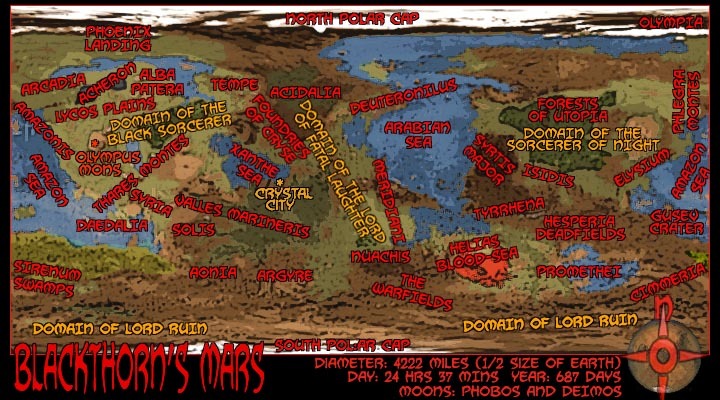 Destroyed by Blackthorn in Dynasty of Mars. Hades - An iron city of Lord Ruin’s. It contains the Circus Terminus. Helias Blood Sea – An unpleasant place. Hesperia Deadfields – The contested lands between the realms of the Sorcerer of Night and the Lord of Ruin. Due to some unknown curse any creature that dies there immediately rises as mindless undead. Iris Market – A village close to Nix Olympus volcano. Isidia – Ancient home of the Isidic Bard-Hall which was reduced to ruins eight hundred years ago. Lycos Plains – Rolling grasslands in the Black Sorcerer’s domain. Mines of Deuteronilus – Mines run by slave labour. Olympus Mons aka Nix Olympus – The largest mountain in the solar system, technically a volcano. The location of the Black Sorcerer’s Bastion which contains almost ten thousand people. The bastion’s central space is the Iron Staircase that connects the levels of the bastion. On the lowest floors are the kitchens, bakeries and alehouses, pantries, sculleries, butteries, butcheries, laundries, sewing rooms and all other necessary domestic rooms. Above them are the barracks, practice grounds, the Holding Suite and Interrogation Pits, the machine shops and for some unknown reason a tiny well-tended mushroom house. Higher yet are staterooms and guest halls with accommodation for entire courts as well as cramped servant and slave quarters. Above that are the main floors with laboratories and workshops in ascending importance. The penultimate level contains a cluttered museum, the Black Sorcerer’s chambers, the Sealed Harem and Aria’s suite. at the very top a brass and iron dome covers the First Man’s personal sanctum. The fortress is also reported to have a Data Reservoir, Bio-Labs, Inquisition Bays and Red Surgeries. Its least entrance is the lava gate. Ostravarne – A village in Secunda Prevura. Phoenix Landing – Location of the original unmanned landing upon Mars, now an unregulated shanty town full of traders and rogues. Prima Prevura – A wetlands in the contested region between the Black Sorcerer and the Sorcerer of Fatal Laughter. Prima Prevura is run by a Matriarchy and sends tribute to both First Men. Promethei – Kingdom in disputed territory between Lord Ruin and the Sorcerer of Night. Its ruler is Lord Throg tan Yanis. Pyriphlegethon District – An administrative region in the heart of the Black Sorcerer’s domain. Red Canyon River – A great water fissure heading into the foothills of Cryse. The resistance has a hidden base here. Scamander – A city in Tempe that pays tribute to the Black Sorcerer. The citadel has spectacular views over the Eridanian icefields and the Mare Cimmerium and and is in the shadow of a Harmony Spire. It has a Sub-Pasha. It’s symbol is a checkered helix. Secunda Prevura – Hot realm of the Gausheen snake-people and the tiny D’Arb-ee, formerly ruled by the Eternal Light. Sirenum Swamps – Marginal difficult territory between the domains of Lord Ruin and the Black Sorcerer. Southern Diacria – The most southern of the Black Sorcerers lands, recently decimated by invasion from Lord Ruin. Tantalus Crossroads – A market close to Nix Olympus. Tempe – A land ruled by the Black Sorcerer, its emblem is a red tree. The Ghost Tower – The Lord of Night’s personal library, one of the best defended locations in Elysium. Now destroyed though the rarest books were rescued to the Hall of Tatters. The Hall of Tatters – A legendary repository of Ancient lore, officially believed to not exist. Shown on no map but located in distant ice-caverns directly north of the Crystal City. Its chief officer is the Mapkeeper. The Warfields – The contested lands between the realms of Lord Ruin and the Sorcerer of Fatal Laughter. Tyrrhena – A desert country punctuated by the Great Arabian River. One major settlement is New Trinachria, known for its slave trade. Ulyxis – Site of ancient ruins, now plundered by the Sorcerer of Night. Valles Marineris – The deepest rift on Mars. Vargo Pass – A mountain pass in the realm of the Sorcerer of Night. Xanthe Sea – A small sea or large lake of fresh water; the city of Crystalia occupies its southeast shore.